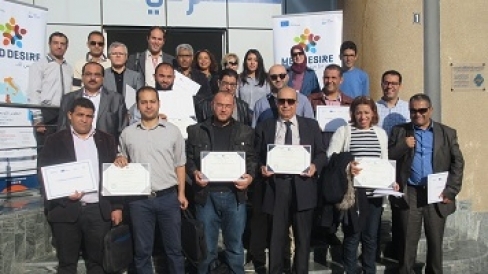 In the framework of MED-DESIRE project, the National Agency for Energy Conservation - ANME, organized in Tunis on November 2 – 6, 2015 a five-day Training of Trainers on PV entitled “Design, dimensioning and implementation of solar photovoltaic systems”. 23 participants from Engineering firms, Control offices and relevant governmental institutions took part in this session. The course was structured into four days trainings insured by technical experts from The Italian National Agency for New Technologies, Energy and Sustainable Economic Development – ENEA and a site visit to a 100 KWp PV plant in the region of Korba. Within the training, two presentations were given by representatives from the National Agency for Energy Conservation on the Tunisian energy context, MED-DESIRE project presentation and the new regulatory framework of the electricity production from renewable energies. At the end of the training, attendance certificates were delivered.